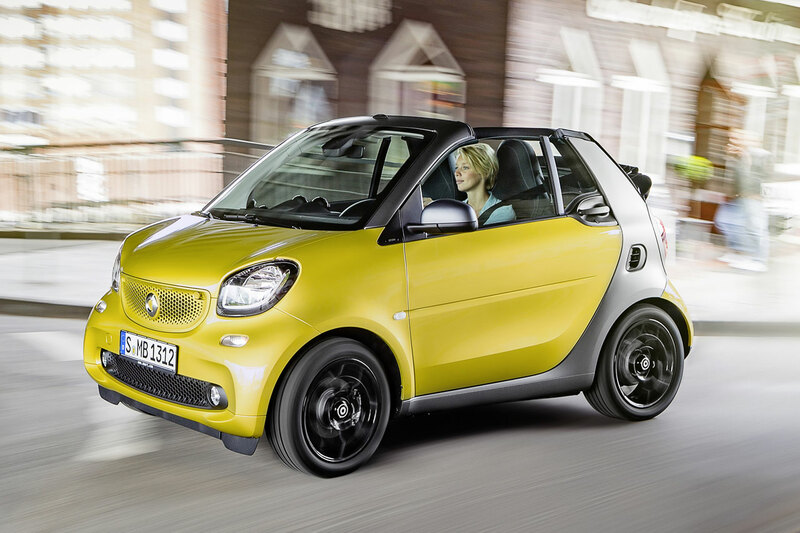 The new smart fortwo cabrio is now available to order from just £13,265 OTR and arrives in showrooms in early 2016. 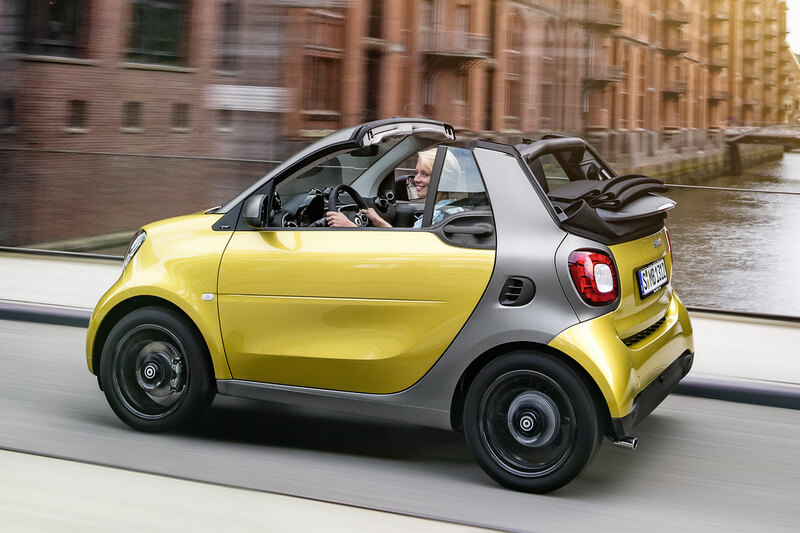 The newest addition to the smart range comes with an electrically-operated fabric roof that can be lowered or raised in just 12 seconds at any vehicle speed, as well as the low running costs, stylish design and dynamic handling that’s familiar from the rest of the smart range. 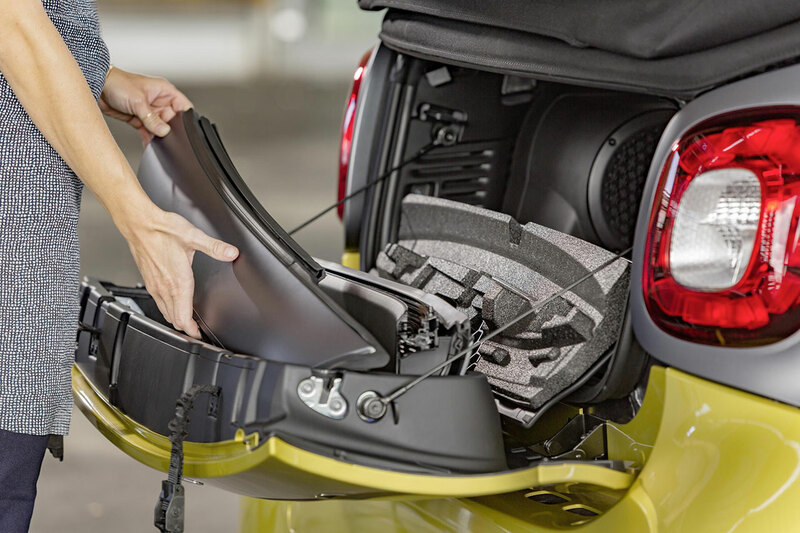 The fortwo cabrio’s triple-layered soft top –including glass rear screen - fully opens, while the roof side bars are removable and fit easily into the cabrio’s folding tailgate ensuring they never encroach into the cabrio’s boot space. The fortwo cabrio comes with a black soft top as standard, but customers can also opt for the red option (£115). A compact wind deflector (£59) is also available. The fortwo cabrio is available with one of two engines - 71 hp or 90 hp turbo - twinned with a new five-speed manual gearbox (available to order in spring 2016) or twinamic six-speed dual clutch automatic transmission (£995), which brings quick gear shifts and even greater efficiency when paired with the 90hp engine. 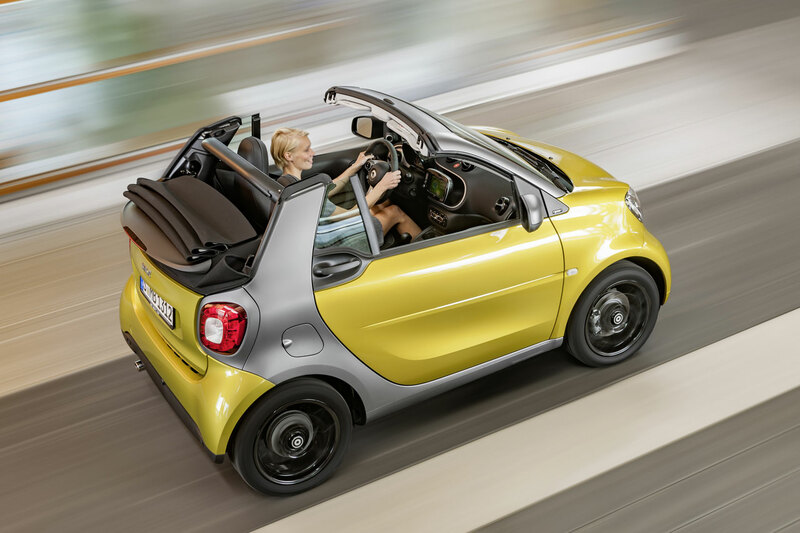 When powered by the 71 hp engine the fortwo cabrio returns up to 65.7 mpg on the combined cycle, emits just 99 g/km of CO₂ and has a top speed of 94 mph. The 90 hp turbo variant (which costs £595 more) returns up to 67.3 mpg, emits 99 g/km and has a top speed of 96 mph. 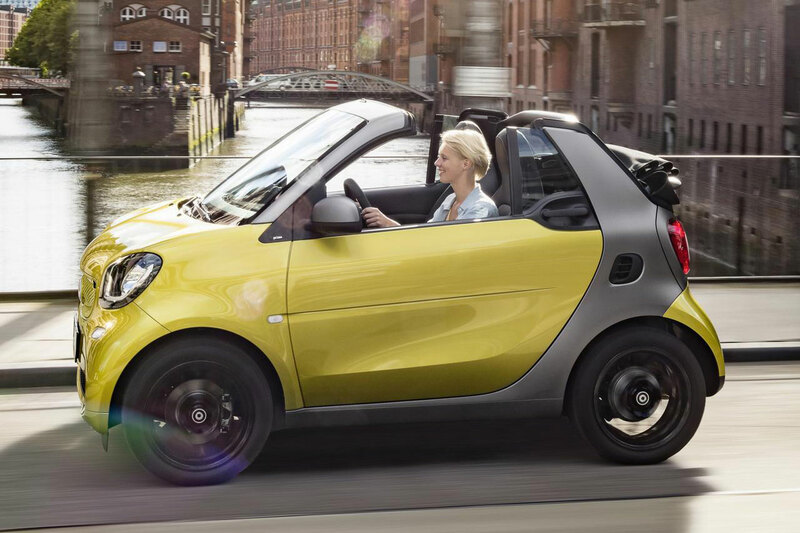 At just 2.69 metres long, the compact dimensions of the fortwo cabrio ensure that it is more agile than ever before. It even sets a new tiny turning circle benchmark at 6.95m kerb-to-kerb making it perfect for city driving, out-turning even a London Cab. On the inside driver and passenger alike benefit from the fact that the fortwo cabrio boasts the most interior space in relation to the size of any car in the segment. Like its fortwo and forfour siblings, there are three model lines available for the fortwo cabrio: passion, prime and proxy. 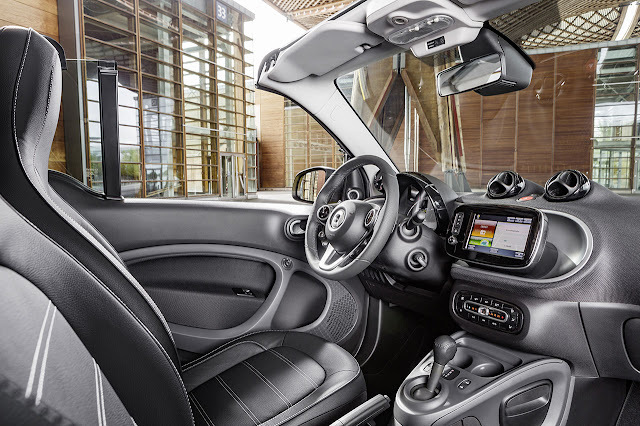 The passion features 15” eight-spoke alloy wheels along with automatic climate control; smart audio system with Bluetooth® connectivity; and a choice of either an orange/black or a grey/black interior. The prime model comes with 15” five-twin-spoke black alloys with high sheen finish; black leather upholstery with grey topstitching; and heated seats. Additional dashboard instrument pods with a cockpit clock and rev counter are a classic smart touch. The proxy model is fitted with 16” eight-Y-spoke alloy wheels in black. It also features a blue and white interior with Artico and cloth upholstery, and – as standard – the Sports Package which includes: a sports perforated leather multifunction steering wheel; sports suspension lowered by 10 mm; rubber-studded brushed steel sports pedals and a chrome exhaust finisher. Both prime and proxy are priced at £695 over passion models. Customers can also choose to upgrade with the choice of the Premium and Premium Plus Packages. The Premium Package is available on passion, prime and proxy model lines (£795) and includes rear parking assistance (acoustic parking sensors); smart media system with navigation; and the Comfort package (which includes a height adjustable steering wheel and heated, electrically adjustable door mirrors). The Premium Plus Package (which includes all the features of the Premium and Comfort Pack) is available on the prime and proxy model lines only, for £1,295, and includes: ambient lighting; welcome home function; LED headlamps with enhanced LED daytime running lights; cube-like LED tail lights; rain and light sensors; and a rear-view camera.